It feels as if Kieran Tierney has leapfrogged countless stages of a youngster’s career over the course of this stellar season. What the teenage Celtic left-back hasn’t done in becoming the most lauded prospect in Scotland is bypass the Bullfrog. So grounded is teetotal Tierney – today named the Scottish football writers’ ECG Facilities Young Player of the Year – his idea of unwinding involves the Playstation, and the pool table with his pals down the pub. The hostelry is The Bullfrog Bar in Motherwell, which is home to a Sunday league team that goes by the same name. The player, who has no intention of moving out of his mum and dad’s house in Muirhouse as he has “never cooked a dinner and never done a washing”, might have become a drooled-over asset for Celtic and Scotland in the past eight months, but this classic campaign will end with him on the sidelines. In the scheme in Muirhouse, where he remains as at home as he always has done. Staying at Celtic, what any fan who was a player would want to do, he sees in his best interests. He would “100 per cent” be interested in a five-year contract that has been mooted, and is sceptical about chat that half of the English Premier League are supposed to be tracking him. “Someone’s just written on Twitter ‘he’s linked to this’ but I don’t know how accurate that is,” he said. 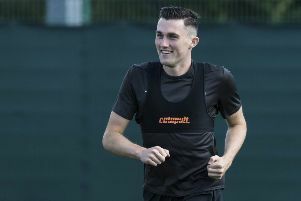 After achieving the triple crown of SPFA Scotland young player of the year, the writers’ equivalent and the club’s own such honour, Tierney has much to live up to next season, under a new manager, with a successor to Ronny Deila expected in the next fortnight.